How to fix DRIVER_POWER_STATE_Failure 0x0000009F Error on Windows? Home »	Fix » How to fix DRIVER_POWER_STATE_Failure 0x0000009F Error on Windows? Issue: How to fix DRIVER_POWER_STATE_Failure 0x0000009F Error on Windows? Need help in fixing DRIVER_POWER_STATE_Failure 0x0000009F. I’ve received this BSOD for more than ten times in one week! DRIVER_POWER_STATE_Failure (error 0x0000009F) is a common problem faced by Windows 10, 7, and 8 users. This error message is typically expressed in a form of BSOD (Blue Screen of Death), what means that it causes some serious problems for the users because the message freezes the screen and prevents users from finishing what they’ve done on a PC. Although usually, DRIVER_POWER_STATE_Failure error shows up when trying to put the system to or take out of sleep, it may also occur when starting up particular programs or booting up the system. The BSOD marked with 0x0000009F value is typically accompanied by system slowdowns, long shut downs, boots up of the system, freezes, and similar issues. Luckily, the emergence of DRIVER_POWER_STATE_Failure (error 0x0000009F) error does not mean that your PC is broken beyond repair. This error indicates the fact that there are some incompletely/incorrectly installed drivers on your system. In addition, it may tell you that there are some issues with the hardware that you’ve recently installed/updated or that some registries on the system have been corrupted. 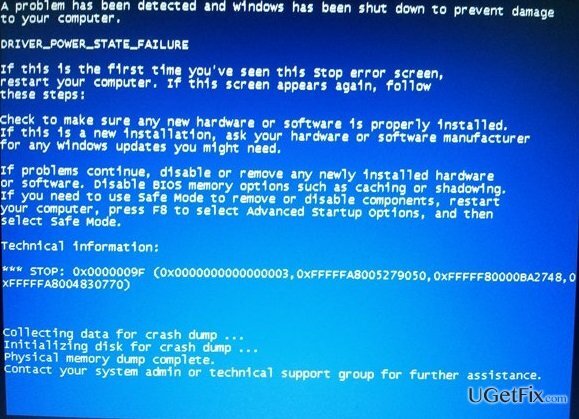 Luckily, specialists have already found several methods that usually help people to fix DRIVER_POWER_STATE_Failure BSOD manually. Press Win key and type Device Manager in the dialogue box. Go through the list step by step and check if any drivers are marked with a yellow exclamation mark. If there are any, right-click on each of them and select Properties. Finally, reboot the system and check if DRIVER_POWER_STATE_Failure error occurs. In most of the cases, this fix has helped. Click on it and then select Uninstall a Program under Programs. Find your antivirus on the list, click on it, and select Uninstall/Remove. Finally, if you do not prefer the previous fixes or if they did not answered the purpose, you may try to run a scan with a PC optimization tool. This way, you would troubleshoot system problems like errors, startup problems, corrupted third-party software, viruses, and similar issues. Our recommendation would be to use Reimage or RegCure Pro.